We’ve long loved Spotify for the ability to create and share playlists with our friends, and because of their own curated playlists. The Discover Weekly is usually a safe bet for finding new music based on what you usually listen to, and their genre playlists are perfect for picking music for a party. Now, Spotify is getting even more specific when it comes to helping you find music you love thanks to their new astrological playlists. Along with help from guest astrologer Chani Nicholas, Spotify has created a line of new Cosmic Playlists just in time for the lunar eclipse on Jan. 20 (the super blood wolf moon). Apparently, this has some sort of cosmic impact on how we all feel, so they were specifically released in coordination with the lunar event. There are 12 playlists, one for each of the sun signs, and they’re specifically curated to be full of songs and artists that are representative of the traits of the signs the playlists are made for. Nicholas explained in a statement from Spotify, “When a song resonates with you, it might feel really personal, like it’s speaking about your own experience, [but] it’s also speaking to a huge, broad audience. When there’s something collectively going on where a song resonates for a lot of people, it’s the same way that a horoscope will speak to the archetypal themes of the moment.” That explains why millions of people can have the same favorite song and somehow relate to the same weekly or daily horoscope. 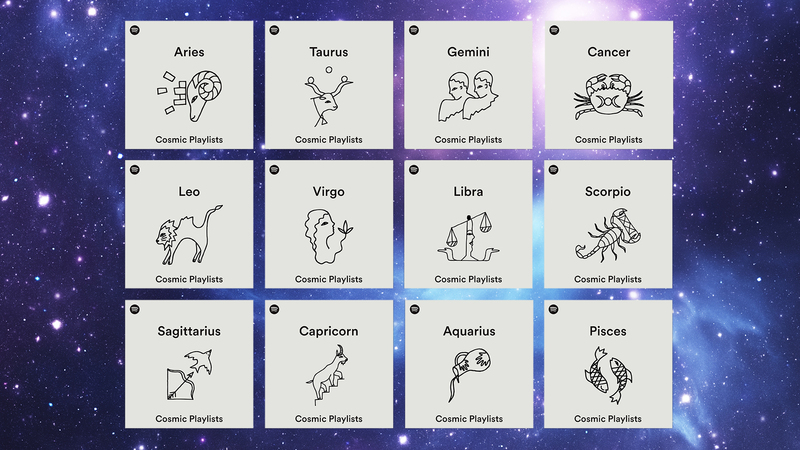 You can listen to just the playlist that’s made for your sign. Or, if there are any other signs you admire and want to try to get in the mindset of, you could try listening to those playlists too. As an Aquarius, for instance, I could use some lessons in follow through and organization, so why not listen to the Virgo playlist while I try to get my life in order? You can check out the astrological playlists by going to the Pop Culture Hub in the Spotify app or on their web player.